Dining is an essential part of the Lubbock experience, so why deprive your attendees of it? West Texas is known for its steaks, barbecue and home-style cooking. Not only is the food fantastic, but you can pair it with something from one of our local wineries. If you’re planning an event in Lubbock and want to include a one-of-a-kind taste of West Texas, check out these five Lubbock caterers that dish out cuisine unique to the region. Evie Mae’s Pit Barbecue has taken the South Plains by storm. Arnis and Mallory Robbins started serving up juicy brisket and ribs for lunch out of a food truck but word quickly spread. Texas Monthly caught wind and came to taste Evie Mae’s firsthand (here’s what they had to say). Demand pushed them into their own brick-and-mortar establishment, but their unwavering commitment to quality control means they continue to cook their meats low and slow. They are open Wednesday through Saturday, 11 a.m. until sell out. 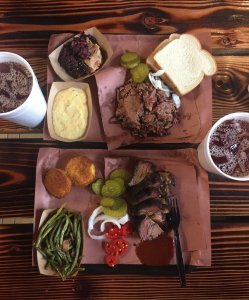 The good news for event planners is that if you hire Evie Mae’s Pit Barbecue as your caterer, you don’t have to get in line early. You’re guaranteed your own mouthwatering serving of that thick, peppered turkey, fall-off-the-bone ribs, pulled pork paired with sides like green chile cheese grits, smoked beans and collard greens. Trust me, you won’t want to miss out on ordering their gluten-free, classic West Texas desserts like chocolate pecan pie and peach cobbler. Evie Mae’s uses a variety of oak woods to smoke around 700 pounds of meat every day. Catering estimates are based on a half-pound of meat per person with the building available to rent during off hours. Can a meal get any more “Western” than eating straight out of a chuckwagon? Take a step back in time and dine like the cowboys did on cattle drives. HX Chuckwagon Catering serves up thick, crispy chicken-fried steaks, tender rib-eye steaks and perfectly seasoned barbecue straight out of an authentic chuckwagon built in the 1890s. Your servers will be dressed in period costumes, and they’ll even demonstrate how they made your biscuits in their Dutch oven. This chuckwagon will come and serve your group at just about any location in Lubbock. They’ve served groups at the National Ranching Heritage Center, the Bayer Museum of Agriculture and the American Wind Power Center. HX Chuckwagon Catering’s wagon is a like a rolling museum, outfitted with original antique tools used at the turn of the century. Your food will be cooked over a wood fire, and they’ll even serve it on enamelware atop quilts on the tables. I love that they can serve an expansive menu—just about anything you can cook in the kitchen can be cooked from the chuckwagon. Stew and cornbread, fancy hors d’oeuvres, even vegan and vegetarian meals. Plus, they can do up a full bar for your group. You’ll need to book HX Chuckwagon Catering a minimum four to six months out, as it’s a popular choice for groups meeting in Lubbock. *Look for their website, hxwagon.com, to launch in summer 2017. 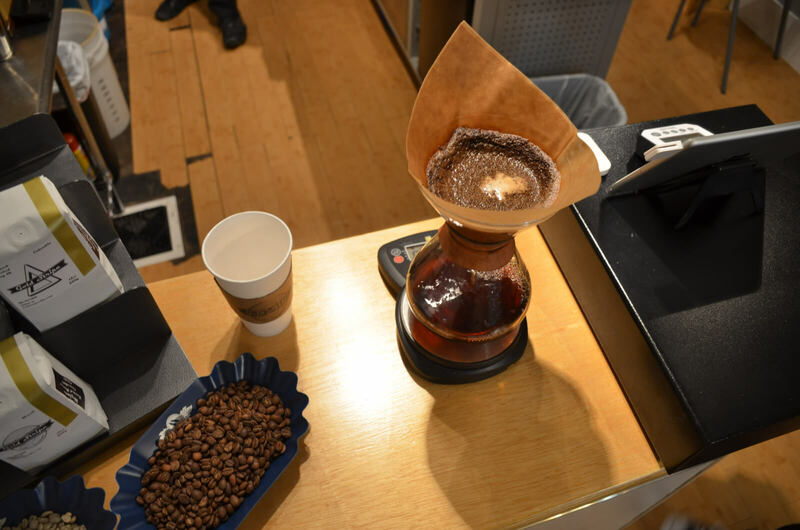 Wake your attendees up with a good cup of coffee. Brothers Zach and Zane started Gold Stripe Coffee Roasters in 2012 after a childhood filled with fond memories drinking coffee with their dad on the family farm in Lockney. The business began as a mobile espresso bar cleverly called Courier Coffee and has grown to now include their own coffee shop in the Cactus Alley Courtyard, along with a coffee catering business. They source the coffee beans from five different countries and roast them here in Lubbock for the freshest taste. Choose from Gold Stripe’s self-serve coffee station or its Mobile Espresso Bar. The self-serve station includes everything you’ll need from cups and lids to sugar, creamer and flavorings. Each station serves 100 guests and will be delivered to your event. To really impress your guests, I recommend the Mobile Espresso Bar. Gold Stripe’s professional baristas will bring their bar to you and craft unlimited servings of flavored lattes, cappuccinos, dark chocolate mochas, chai tea lattes, americanos, espressos and hot chocolate. Yes, those mugs include latte art! This two-hour service can be extended if need be. Gold Stripe Coffee Roasters brings that over-the-top West Texas hospitality everyone talks about directly to your event. Named lovingly after their grandma who everyone knew for her good cooking and inviting spirit, Honeychild Catering Solutions can pretty much make it all. They’ll create a custom menu to your liking and can even recreate a special recipe for your event. I recommend starting off with their “Texas Kisses” – brisket-stuffed jalapeños deep-fried and wrapped in bacon. Now that’s a warm West Texas welcome! If Honeychild caters your food, they’ll provide TABC-certified bartenders who will follow any specialty cocktail recipe you ask them to. Chiltons for everyone! The Cast Iron Grill is the epitome of Southern comfort food, and catering has become their bread and butter. 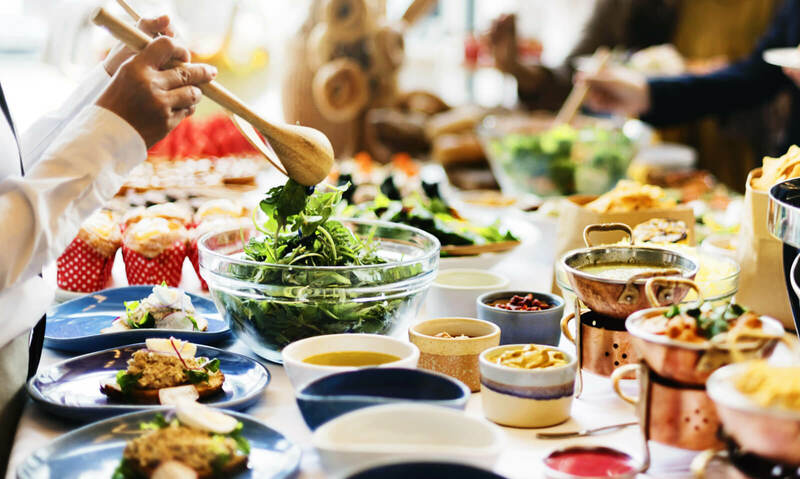 Groups gather around their favorites like hand-breaded chicken-fried steak, prime rib, hand-cut rib-eye steaks, fajitas, barbecue and center-cut pork chops. They don’t let you forget you’re in Texas with sides like potatoes au gratin, ranch-style beans, and macaroni and cheese. While all of this is delectable, it’s Cast Iron’s homemade pies that will have the group eating out of the palm of your hand. These jumbo melt-in-your-mouth pies are the real deal. Southern pecan, buttermilk chess, banana pudding, millionaire and strawberry fudge are just a few of the delectable options Cast Iron whips up. These aren’t the only palate-pleasing caterers you can hire for your next event in Lubbock. See other options here. If you want to learn more about arranging catering services or anything else about hosting your next event in Lubbock, check out visitlubbock.org/meet.